[Janesville, WI – May, 2018] – RitterTech-WI announced that it is opening a ParkerStore™ located near Janesville, WI, its seventh ParkerStore™ location in the state of Wisconsin. RitterTech-WI is a division of Motion & Control Enterprises (MCE), a leading industrial distributor of Parker Hannifin motion and control products and systems. A soft opening is scheduled for May 10th with a Grand Opening Celebration scheduled for Thursday, June 7, 2018 from 11 a.m. to 2 p.m. at the new Janesville ParkerStore™ located at 1520 Plainfield Avenue, near the intersection of Interstate 39, WI-26 and US Highway 14. The celebration will include door prizes, a free barbecue lunch, Milwaukee tool raffles, and product demonstrations. Wisconsin in Pewaukee, East Madison, West Madison, North Milwaukee, West Milwaukee, and in Sturtevant. MCE has on-hand inventory of more than $12 million to support all its divisions backed by $150 million of available inventory through its association with the DistraNet Inventory Sharing Group. MCE is a multi-state, industrial distributor of Parker Hannifin motion and control systems, Graco industrial lubrication equipment, and Enerpac high-pressure power tools, along with an extensive line of other top-tier fluid power and industrial lubrication products. Nationwide, MCE operates more than 20 retail and mobile locations in WI, IL, IN, MI and PA, providing automation expertise to the Great Lakes Industrial Region through the combined resources of operating divisions including RitterTech, Primet Fluid Power, Tri-State Hose & Fitting and Fluid Systems Engineering. 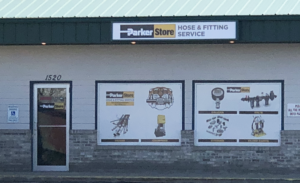 The ParkerStore™ brand is owned by Parker Hannifin Corporation and through this chain of stores offers a local source for hydraulic and pneumatic products backed by the knowledge and application expertise of store teams who are focused on building on-demand hose assemblies which minimize downtime and maximizes production uptime and efficiency.